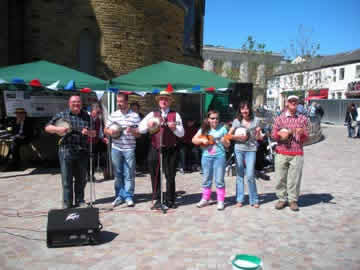 Blackpool sunshine greeted members of The George Formby Society when they played an outdoor concert in St Johns Square opposite the main entrance of the Winter Gardens. 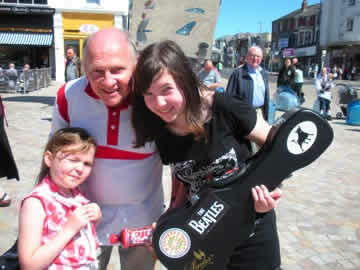 The members talent and enthusiasm was rewarded with some much needed donations for Donna's Dream House, a well known and well deserving Blackpool charity for seriously ill young people. The day was put together by Donna's Dream House representative Alan Chenery who also just happens to be the concert organizer for the GFS. He was ably supported by GFS President Gerry Mawdsley who was accompanied by his wife (and GFS Secretary) Vivien. GFS Blackpool branch members also supported the event and included Alan Southworth, Gary Hampson, Alan Yates, Steve Helme and Francesca Davies. Well done to all concerned for giving up their time and talent for such a noble cause. 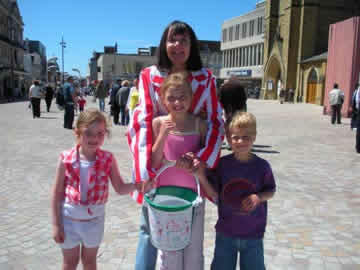 Their efforts and the generosity of Blackpool people help to raise £340 on the day.